Efforts over the last 25 years have pushed Medicaid spending away from an institutional approach towards home and community based care, which is more cost-efficient, person-centered, and customized to each individual . A bill now before Congress would go a long way toward making that the law of the land. The Disability Integration Act addresses the fundamental issue that people who need long term services and supports are forced into institutions and lose their basic civil rights. It would prohibit governments and insurers from denying community-based services that would enable these persons to live in the community and lead an independent life. The legislation was introduced by Sen. Chuck Schumer ( S.910 ) in the Senate and Rep. Jim Sensenbrenner ( H.R.2472 ) in the House in April 2017 and has grown to have 102 co-sponsors in the House and 23 in the Senate, which includes 14 members of Illinois' congressional delegation (with both our senators). This step builds on the Community First Choice option , enacted as part of the Affordable Care Act, which allows states to provide home and community based attendant services and supports to Medicaid beneficiaries via Section 1915 (k) state plan amendments. 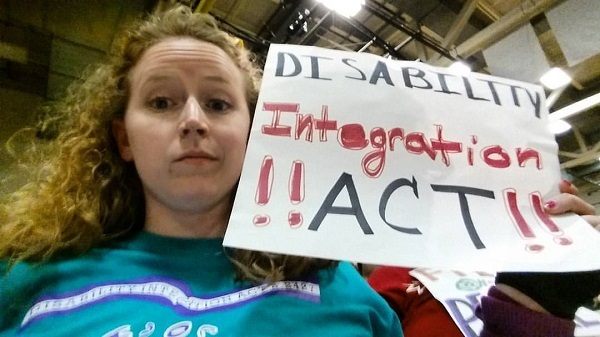 You can "like" the Disability Integration Act Facebook page for updates. Last week, the AIDS Foundation of Chicago submitted a Freedom of Information Act request to the State of Illinois departments of Healthcare and Family Services (HFS) and Human Services (DHS) asking for all documents and data related to Medicaid auto-terminations in the Integrated Eligibility System computer system. "Thousands of low-income, vulnerable Illinoisans are being incorrectly and wrongfully terminated from Medicaid because of computer glitches," AFS stated in its announcement , "but Gov. Bruce Rauner’s administration refuses to share accurate and comprehensive data on how big the problem is. The request follows a June 7 letter from more 100 organizations asking the departments to suspend the auto-termination process given the large increase in inappropriate terminations. Earlier this month, Chicago joined Baltimore, Columbus and Cincinnati in a lawsuit charging that the Trump administration is intentionally and unlawfully sabotaging the Affordable Care Act. The suit, filed August 2 in U.S. District Court in Baltimore, names Trump, HHS, HHS Secretary Alex Azar, the CMS, and CMS Administrator Seema Verma as defendants. Residents of Charlottesville, Virginia, also are part of the lawsuit. The suit cites harms to the plaintiff cities in the form of higher immediate costs to serve uninsured and under-insured residents as well as downstream costs of a population that is sicker and less productive. As noted in our alert this month, HB 2624 , the Short Term Limited Duration Health Insurance Coverage Act , would limit these plan in Illinois to 180 days and require plain language on all materials explaining what is not covered. Under recently finalized federal regulations, "short term plans," which are not bound by ACA consumer protections and can deny coverage for pre-existing conditions, could be extended for up to three years. Also on the governor's desk is HB 4165 , the Do No Harm Healthcare Act , which would prevent the State from applying for any federal waiver that would reduce or eliminate any ACA-mandated protections or coverage that went into effect on January 1, 2017.